A cold night followed by clear blue skies, no wind and no rain – a warm day, about 20 degrees during the afternoon. 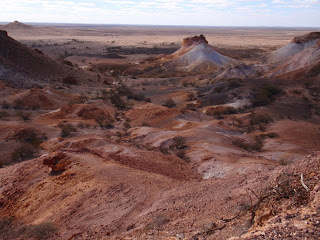 Today we headed for the Breakaways, a chain of mesa to the north west of Coober Pedy. These were the location sites of Mad Max and Priscilla, Queen of the Desert. The scenery was absolutely stunning; we drove in to the edge of a cliff and the mesas fell away to both sides of us. The colours were just incredible, from white to a rich ochre, the ground either orange or black gravel. We drove along the cliffs before heading to the desert floor – gibber, or stony, desert as far as we could see. It was here that Mad Max was filmed – there is just nothing except stones. Although there is now some gold to be found in the desert – one of my earrings! Lots of photos taken here to bore the relations when we return. The track wound around the base of the mesas before emerging alongside the dog, or dingo, fence. This fence stretches over 5,000 kms from Queensland to South Australia and obviously does keep the dingos out, because we didn’t see any! Both Les and Cat kept a sharp eye out. 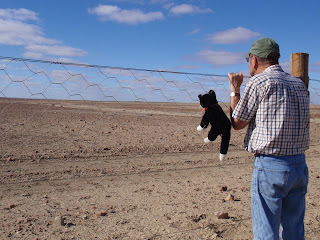 Our return to Coober Pedy was via the Oodnadatta Track. Keep cat safe from the dingos when you get to Ayres Rock won't you? Oh, Jack announced the other day that he misses you. Will probably give you a ring sometime on the weekend so he can say hello.